The Katiki Waterfalls is in Araku near Borra Caves in Vishakhapatnam in the state of Andhra Pradesh.It is located 7 KMs away from the ancient Borra Caves. Gatevalsa, the nearest place to the Caves, have Jeep services offering you a trip to waterfalls. 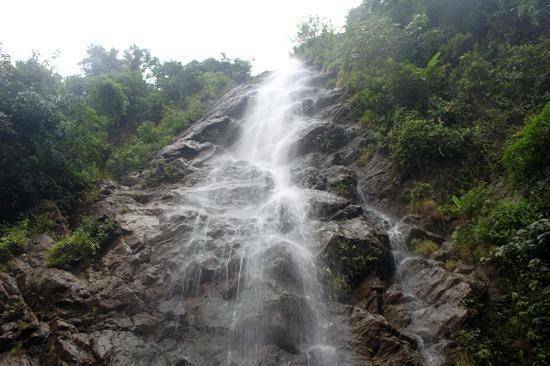 This 120+ feet high cascading waterfall has to be reached by 20-30 minutes trek (one way) through lush forest and upwards to mountain top from the nearest motorable road. To reach this waterfall from Araku, you have to take Borra Caves road at Mulyaguda junction between Vizag and Araku (around 30 Kms from Araku, after Anantagiri). If you’re an adventure seeker and a nature lover, then this is the place for you. Also there is the must-eat bamboo chicken made by local tribal people on the way of climbing a falls.